Originally published in Mathematics Today, April 2017 first published as part of the Westward Ho! Series of Musings on Maths and Mechanics from the West of England by Alan Champneys in the IMA Mathematics Today magazine. Cooper’s Hill near Gloucester witnesses a curious event every Spring Bank Holiday; the annual Cheese Rolling and Wake . A master of ceremonies, whose role also involves sprinkling confectionery at the top of the hill, presides over a family festival where a cheese is rolled down a steep concave hill, chased by the youngest and fittest in the vicinity. It is a race. There are no real rules nor any accepted technique; those mad enough to take part can be seen to variously run, bounce, bum-shuffle or tumble, often all four, often unintentionally. There are multiple races, and separate men’s and ladies’ events. The grassy slope is particularly uneven and each year it becomes decidedly muddy after the first race, especially on wet years. At the bottom a group of bulky fellows act as catchers, and St John’s Ambulance staff are on hand to treat the injured. And the prize for the winners? Why, they get the cheese, of course. The origins of the event are mired in mystery. Some say it was a means by which the local villagers of Brockworth would annually assert their grazing rights on the hill. Others claim it is a pagan rite and the cheese would have originally been a burning bundle of brushwood, used to ward off the spirits of winter. And then, as with many such West Country festivals, others claim it is a fertility rite. I do not know about this, but certainly much cider is drunk both before and after in several local hostelries and there are high spirits among the ever larger crowds that gather to watch each year. Each cheese takes the form of a squat cylinder (of Double Gloucester, naturally), supported by wooden sides, tightly wrapped and tied together with bright ribbon. In theory the racers are trying to catch the cheese, but in practice the cheese is given a one second head start and reaches the bottom long before any human participant. The truth of the matter is that the cheese is a far more efficient tumbler than a person. This has got me thinking as to why that is. Three particular questions in mechanics came to mind. First, there is Euler’s theory of tumbling bodies, which many of us teach to undergraduates. The motion of a general rigid body about its centre of mass, in a rotating frame, can be described by the vector equations , where is angular velocity, is an applied torque and is the inertia matrix. In the case of a uniform solid cylinder, it is not hard to show that the principal moment of inertia about the cylinder axis is smallest, which means that rolling motion about that axis will be stable, whereas spinning motion about a radial axis will be unstable. 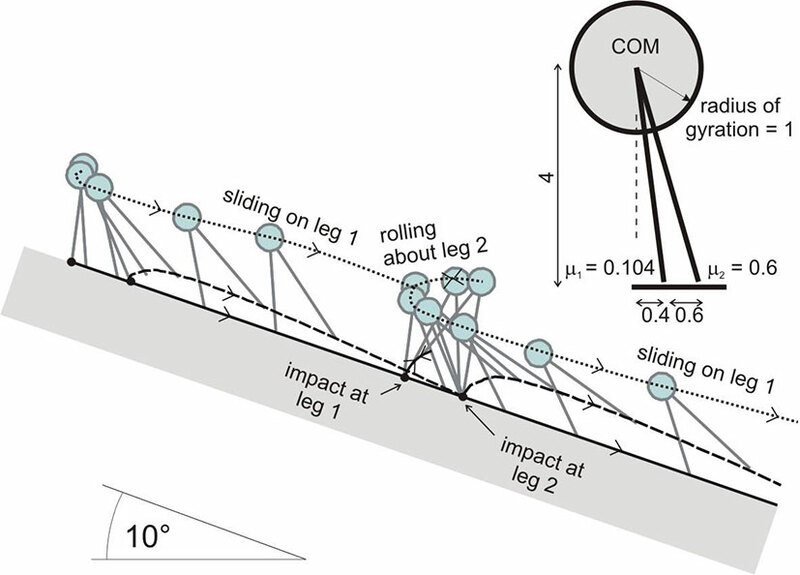 Thus, provided the cheese is rolled upright down the hill, as it gains linear momentum down the slope, it will grip the grassy surface of the hill, and so gain angular momentum about its cylindrical axis. This angular acceleration will dwarf any perturbations and the cheese will continue to roll faster and faster down the hill. In practice, the cheese bounces, due to non-uniformity of the slope, but each discrete bounce leads to a further injection of torque about the cylindrical axis, and the same argument applies. For a human on the other hand, in an approximately upright running position we could crudely approximate their body shape as a cuboid, which has three independent principal moments of inertia. Facing down the slope, any tumbling head over heels will correspond to rotation about the axis with the intermediate moment of inertia. But as all students who have studied Euler’s equations will know, only motion about the principal axes with smallest and largest moments of inertia is stable. Motion about the intermediate axis is unstable and will rapidly lead to chaotic tumbling. If by chance you have not seen this before, try it with a matchbox (preferably empty) by spinning it in the air three different ways, allowing it to rotate about an axis through the centre of mass passing through the centre of each of its three perpendicular faces; the top, the side and the end. In fact, various athletes and performers instinctively know how to spin stably. Acrobats find it considerably easier to cartwheel than to tumble end over end. Ice skaters accelerate during spins by standing upright and pulling their arms and legs in, thus lowering their moment of inertia. The most successful competitors in the cheese rolling race try to stay on their feet. If you have ever tried running down a steep hill, you may have noticed just how hard your legs have to work to provide a counterbalancing force to stop yourself either falling forwards or slipping backwards. If balance cannot be maintained, most competitors seem to favour slipping backwards as the bottom is closer to the ground and tends to have better cushioning than the head. So this next got me thinking about the mechanics of stick, slip and bounce. I recall many questions on these kinds of problems in A-level mechanics – questions about perfectly elastic snooker balls, rigid ladders, smooth walls and sticky floors. One might imagine that using a combination of rigid-body mechanics, Newton’s law of restitution and Coulomb’s law of friction, it would be relatively straightforward to write a simulation code for the motion of a rigid cheese of whatever shape rolling down a rigid slope of whatever incline, in two dimensions at least. Indeed, there are several commercially available rigid-body-mechanics packages that can simulate the motion of many such bodies, interacting with the slope and each other, in three dimensions and even taking into account multi-physics effects such as temperature and fluid mechanics. Figure 1: Three traces left by chalk moved by hand across a rigid blackboard (reproduced from ). But wait. From a mathematical point of view, it is known that any theory of rigid-body mechanics with a non-smooth Coulomb-like friction law and Newtonian restitution theory is ill posed. Yes, ill posed. That is, there are open sets of initial conditions which when simulated forwards in time reach a singularity from which there is no unique forward continuation. In planar rigid-body mechanics, this phenomenon is known as the Painlevé paradox, after the French mathematician, aerospace engineer and politician Paul Painlevé (1863–1933), who first succinctly explained the phenomenon . I do not have space to go far into the theory, nor implications, of the Painlevé paradox here; I refer the interested reader to a recent review in the 50th Anniversary Edition of the IMA Journal of Applied Mathematics . I claim though that within mathematics Painlevé deserves far more recognition for this work than for the rather esoteric hierarchy of differential equations and their invariants that also bear his name. The paradox itself, once thought to be a mere mathematical curiosity, in my view points to a fundamental instability that we experience in everyday life. This instability lies at the heart of the reason why chalk is easy to drag across a blackboard but hard to push. 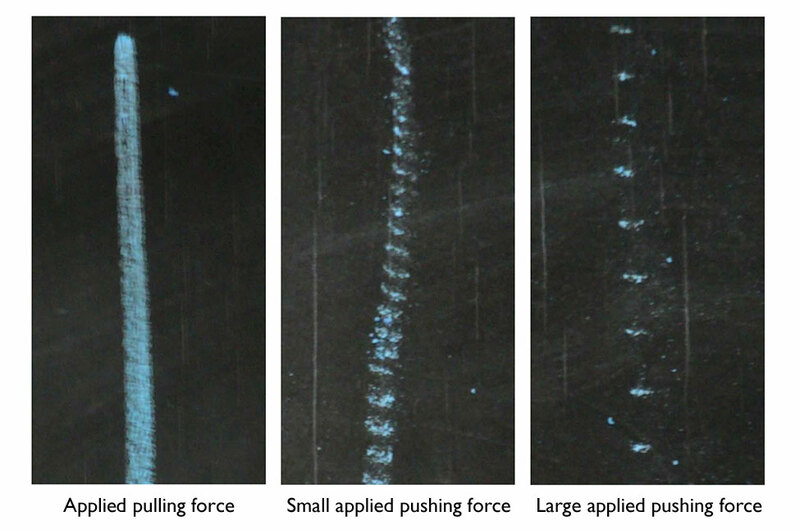 Indeed it is well documented that the woodpecker-like instability encountered upon pushing the chalk can be perfected as a technique to draw a regular dashed line, rapidly and reliably (see Figure 1). What is unusual about such motion? Well, typically the teacher is pushing the chalk uniformly towards the board. As the chalk slips it reaches a point sometimes known as dynamic jam, where the tangential motion of the tip comes to an abrupt halt and the chalk lifts off with finite normal velocity. Such an almost instantaneous event is also known as a tangential shock, or more aptly an impact without collision, because the chalk tip instantaneously leaves the board with finite normal velocity from a state with zero normal velocity. This would appear to defy causality. The truth is that during the impact energy is instantaneously transferred, through the rotational degree of freedom of the chalk, from tangential to normal momentum. Now, assume that in the absence of contact forces the body is pushed towards contact, that is . Thus, provided we find a unique positive normal force. But strange things happen if there is sufficient coupling between normal and tangential degrees of freedom, or the coefficient of friction is sufficiently high so that . This would correspond to a negatively stiff rigid surface – the more the body is pushed towards a constraining surface, the more it is sucked in. This is what can cause the impact without collision. Such singularities require further physics to be fully resolved, which is a subject of ongoing research. In essence, the Painlevé paradox is just one of the many physical absurdities that are inherent whenever we make a rigid-body assumption. Other examples are action at a distance and infinite wave speeds. But like most mathematical theories, Newtonian mechanics is just a model of reality, not reality itself. Finally, I wonder what effort would be required to get the cheese rolling if it were merely balanced at the top of the hill rather than actively pushed. I am drawn to the question of stability of a rigid body resting on one or more points. What if the cheese had some irregular shape, like one of the familiar wedge-shaped pieces sold at grocery counters. How steep would the slope need to be for it to fall over – to roll, slip or tumble? Consider first a solid body of constant density resting on a flat surface. How many ways can it be so balanced? Most objects can be balanced in multiple configurations. But in 2006 Peter Várkonyi and Gabor Domokos from the Budapest University of Technology and Economics showed that it is possible to construct a homogeneous body that can rest on only one point . It is perfectly self-righting. This feat may not seem remarkable, but most self-righting bodies, such as the toy I remember as a child (‘Weebles wobble but they don’t fall down’), are inhomogeneous, decidedly bottom heavy. The shape Várkonyi and Domokos came up with has uniform density. It is like a chiselled and slightly squished ball and they christened it Gömböc, a diminutive of the Hungarian word for sphere, which also refers to a haggis-like sausage that is anthropomorphised in a famous Hungarian folk tale. It has since been observed that certain species of tortoise, nature’s own self-righters, are approximately Gömböc shaped. Figure 2: Simulation of the response of a heavy planar rigid body to a small perturbation of its equilibrium configuration on a perfectly inelastic slope. © 2017 IEEE. Reprinted, with permission, from . This principle is named after Clive Kilmister (1924–2010), an applied mathematician and Head of Department at King’s College London, who with Herman Bondi and Felix Pirani set up the highly influential Gravitational Theory Group there. The principle is entirely reasonable. Put simply, it states that you first see whether stick, slip or lift-off is possible at each contact point. Only if it is not possible to construct a valid solution to the initial-value problem should you consider the possibility of impacts (with or without collision). Várkonyi and Or were able to show that this principle is false. By considering bodies with two contact points, they showed there are examples where there can be several feasible solutions, but that none of them are observable because they are unstable. Instead, the body can undergo microslip oscillations, or reach paradoxes where the contact forces at one contact cause the Painlevé paradox. Figure 2 shows a simulation of a rigid body that provides a counterexample to Kilmister’s principle. It is a two-legged body, which has feasible statically stable equilibrium where both contact points stick (see ). But this state turns out to be dynamically unstable as one leg would start to slip while the other lifts off, causing a sequence of events leading to the body tumbling down the slope. All this may seem rather esoteric, but again shows that something apparently as simple as rigid-body mechanics has many mysteries to it when we look a little bit deeper than the overly idealised mechanics many of us learned at A-level. It remains to be seen whether these considerations have any actual connection to cheese rolling. Each year the event becomes more popular. Long part of the local Gloucestershire scene, it was first brought to wider public attention in the 1970s by the comedian Dave Allen, who featured the Cheese Rolling and Wake during his TV show Dave Allen at Large. But, as its popularity grew, so did concerns over the number of injured, especially with the advent of our modern ‘health and safety’ culture. It is dangerous. People get hurt. I seriously do not recommend taking part. 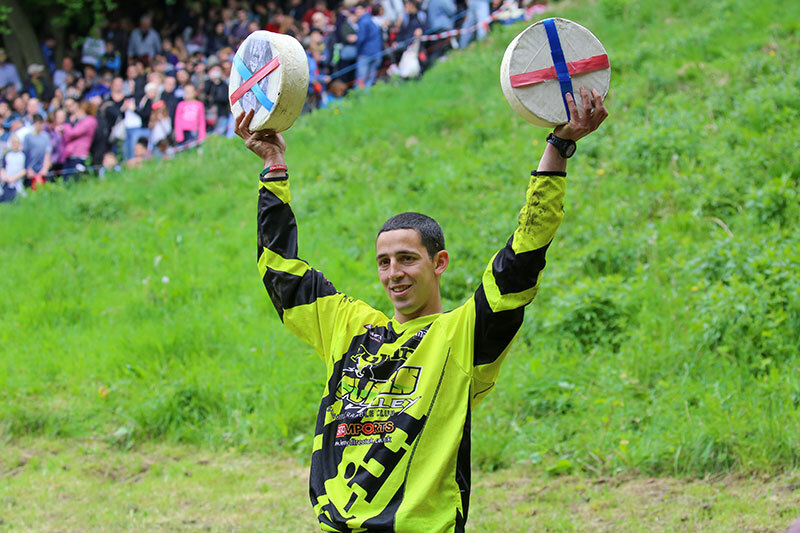 The unbeatable king of the hill, Chris Anderson, double race winner of the 2016 Cheese Rolling competition. This brought his total to 15 cheeses won over 11 years. The future of cheese rolling was cast into severe doubt in 2010 when an obligatory safety certificate was refused and the event had to be officially cancelled. There had been other cancellations, due to foot and mouth or one-off unavailability of St John’s Ambulance or other volunteers. But in those years, the organisers nevertheless rolled a cheese down the slope to keep the tradition alive. In 2010, however, it was stipulated that the event could be run again only with an admission charge, safety barriers, risk assessments, indemnity insurance and paid stewards, which was thought by many to threaten the very essence of the ritual. This led to a ‘Save the Cheese Roll’ campaign and about 500 people turned up anyway to race. A police helicopter circled, but there were no arrests. Each year since, the event has run peacefully and (relatively) safely, but in a strictly unofficial capacity. Oh, I almost forgot my promise to provide a connection (albeit tenuous) with the heavy metal band Motörhead. The charismatic bassist and lead singer Lemmy was actually born Ian Fraser Kilmister. I have no evidence to suggest that he was related to Clive Kilmister, nor that he ever witnessed a cheese rolling. But I recall Lemmy’s death at the fag end (literally) of 2015 and how that seemed to shepherd the loss of so many pop icons as we moved into 2016 – David Bowie, Prince, Leonard Cohen and George Michael to name just a few. So, I should like to propose a new, very different, Kilmister’s principle: as we age, we become increasingly aware of the passing of the heroes from our youth. Roll the cheese! Cheese-rolling.co.uk. 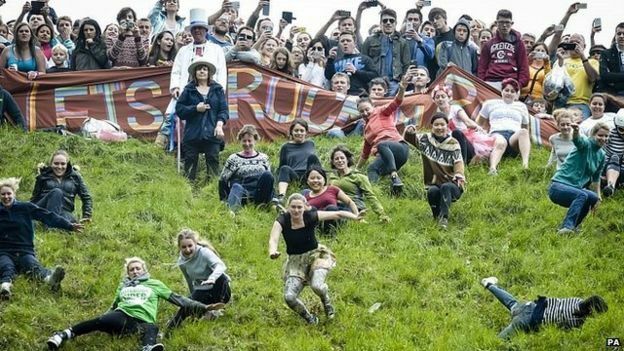 (2017) The official site of cheese rolling at Cooper’s Hill in Gloucestershire. Available at: www.cheese-rolling.co.uk (accessed 15 February 2017). Champneys, A.R. and Várkonyi, P.L. (2016) The Painlevé paradox in contact mechanics, IMA J. Appl. Math., vol. 81, no. 3, pp. 538–588. DOI: https://doi.org/10.1093/imamat/hxw027. Painlevé, P. (1895) Sur les lois du frottement de glissement, Comptes Rendu des Séances de l’Académie des Sciences, vol. 121, pp. 112–115. Várkonyi, P.L. and Domokos, G. (2006) Mono-monostatic bodies: the answer to Arnold’s question, Math. Intelligencer, vol. 28, no. 4, pp. 34–38. Várkonyi, P.L., Gontier, D. and Burdick, J.W. (2012) On the Lyapunov stability of quasistatic planar biped robots, IEEE International Conference on Robotics and Automation (ICRA), pp. 63–70. Brogliato, B. (2016) Nonsmooth Mechanics, 3rd edition, Springer, London. Republished from IMA.org. Orginally written by Alan Champneys for Mathematics Today.